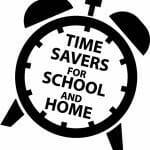 · Schedules /Timetables – these are VITAL no matter what age. This may be in a range of formats such as photos, visuals or words. (See page 3) Send these home ASAP. · Note Pad and Pen – always carry a note book and pen for when things change we tend to talk too much. These children are visual and if you can write it down or draw a picture it can stop behaviour escalating. · Expectations – set up classroom expectations. This is particularly important in secondary where staff often assume the student should know the expectations which change depending on the subject. Make sure clear, concise and explicit rules. For example “We Care, We Share” doesn’t explicitly tell the child how to care and share. You may need to write a list as a class what this means. · Eating – because of their sensory processing difficulties some students find it hard to eat at appropriate times because the smells of other students’ food or even the sound of them eating may be overwhelming. You may need to allow them to eat separately from the other students. · Parents/Carers – remember you can support your child by letting staff know which of the above have worked in the past and which of these are important to your child. · Early Years – please note the above considerations are also important for your setting. You may need to also consider structure for nap times and often you will encounter more sensory issues because of the type of activities the children are engaged in, for example more play and craft activities can mean more sensory activities.